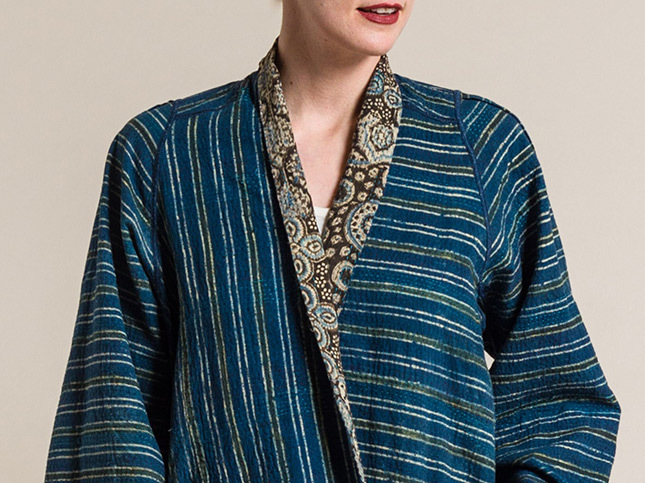 Now available online, new kantha jackets from Mieko Mintz. The reversible kantha jackets are made from vintage saris that are embroidered stitched together. The distinct stitch originated and is traditionally worn in Bengal. While originally from Japan, today Mieko currently works with women in West Bengal, which allows her to artfully combine saris and create the kantha fabric used to make the cotton jackets. As a result, each coat is a unique, handmade blend of bright patterns.